The path down from Vroutisi to Ancient Arkesini is well paved and easy to navigate. There are nice views as you descend to this peninsular. The cache is by the path past the city around the bay. 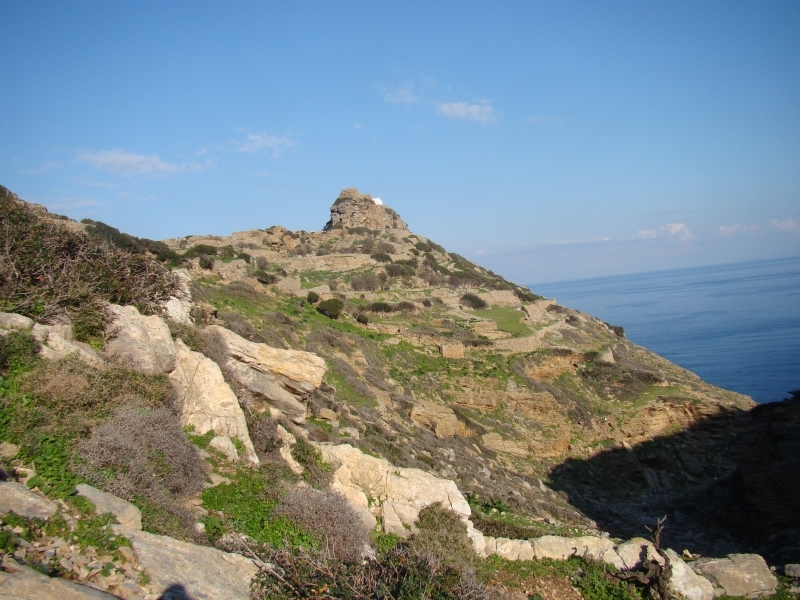 The ancient city of Arkesini was first established in the 10th to 8th centuries BC by settlers from Naxos and was inhabited until the middle ages when it was abandoned due to the threat from pirates. There is evidence of extensive quarrying in the area in ancient times. During the early Cycladic period, walls, buildings and defensive towers were constructed and many relics, inscriptions, sculptures and pottery from this era have been found. There is also evidence that during the 3rd – 2nd centuries BC that there was regular contact with Rithymna in Crete. During the Geometric and Roman periods an ancient underground aqueduct was formed into an arched water cistern. Roman tombs have been found, along with an acropolis dedicated to Aphrodite and Athena, and a road that was lined with colonnades and inscribed steles. During the Venetian period extra fortifications were built. Today many of the ancient structures can still be seen. The cache is in a plastic drink container with a blue top. It just contains a log and a geocaching declaration in Greek and in English. Please take a pen with you. Just hope that it has not rolled down into the bay.